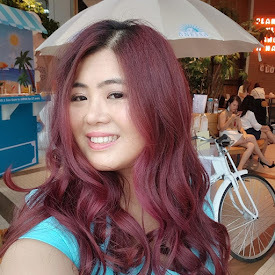 For the longest time, we all know having a fair and flawless complexion is the dream of every (Asian) girls because it symbolised beauty and femininity. Drawing on its extensive botanical research, L’Occitane has discovered a plant with the power to whiten and spectacularly illuminate the skin. Reine des Prés is a pure white flower illuminating its petals over time. Inspired by its immaculate beauty and unparalleled luminosity, L’Occitane has created the REINE BLANCHE Illuminating Program for a fair and translucent skin. Day after day, the skin recovers its natural translucency and inner light, glowing with immaculate radiance. 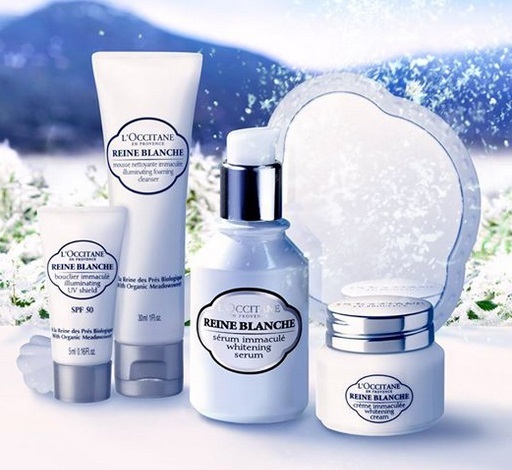 L'Occitane Reine Blanche range comes with 4 products, Foaming Cleanser, Whitening Cream, Whitening Serum and Illuminating UV Shield. Out of these products, the serum and UV shield managed to won our local magazine editor's favourite products. Thanks to L'Occitane Malaysia, I got a bottle of Illuminating UV Shield to try out. Love the white glass bottle that comes in a pump, very minimalist yet elegant design. Reine des Prés is a pure white flower known for its lightening properties: the flower is illuminating its petals over time. It naturally contains salicylic acid - renowned for boosting luminosity and helping epidermal renewal. Inspired by its immaculate beauty and unparalleled luminosity, L’OCCITANE has created the Reine Blanche Illuminating Program for a fair and translucent skin. With its moisturizing formula, the Illuminating UV shield instantly offers comfort and a sensation of incredible smoothness, leaving skin feeling optimally protected, plumped and hydrated. Protect skin against external aggressions. 1) Take a quarter size of sunscreen/2 pumps and warm between your fingers. 2) Starting from your nose, apply outwards to your ears and your entire face, then apply on your forehead with alternate outward movements, finish on your neck and chest area. 3) Make sure that your skin is clean and dry, and apply after your daily moisturizer and before applying make up. A you can see from the picture, the texture is milky lotion, it's quite thick compared to my usual sunblock. Surprisingly it's not sticky at all and it makes my skin feel smooth & hydrated after applying it. Although I was worried when I see a white cast on my face while I was applying the product but after a while it disappeared once it's set on my skin. One thing I really like about this sunblock is that unlike usual sunscreen, L'Occitane Reine Blanche Illuminating UV Shield has this lovely floral scent which I find it therapeutic. It finds my skin feel hydrated and not oily even though I have been out in the sun all day long. The SPF 50 is great for my everyday use, keeping my skin safe from the harmful UV rays. Plus their lightening properties and SPF50 help my skin looks brighter and protected over time. I remembered a while ago, a friend told me she does not use sunblock ( yes there are still people that ignore the importance of sunblock) because she feel it's oily on her skin plus she works in the office. I told her the right sunblock would not make her face oily but comfortable all year long. Not sure how many times I have been mentioning this, harmful UV ways it's the number 1 reason that cause skin aging and pigmentation. And UV rays can reflect off windows, concrete roads and penetrate through glass windows, so even you work indoor you are still expose to UV rays.